A new show popped up on our Netflix recommendations. 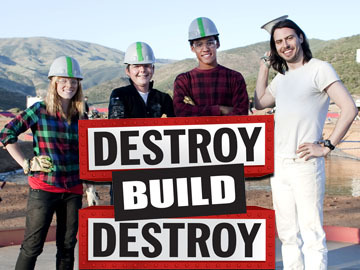 It's called Destroy Build Destroy. If you have fond memories of the building and bodging that was JunkYard Wars (Scrap Heap Challenge in the UK), then this show will look familiar. There are some important differences, however. Firstly, it's clearly aimed at kids. The constants that make of the two teams are around 12-14. Rather than leave tweenagers in charge of MIG welders, they are assisted by a "build team" in their constructions. The other major difference is in where the raw materials come from. Rather than a heap of scrap, the teams are presented with perfectly functional vehicles, like an SUV or a tractor trailer. The first "Destroy" in the title comes early on when the vehicles are wrecked to produce the raw materials for the build. A nice twist is that each team gets to pick the path of destruction for the other team's vehicle. The choices are usually something explosive (like a bazooka round), something physical (like being dropped off a cliff) or an angry set of burly guys with pick axes a crow bars. Don't be fooled, a motivated bunch of guys with hand tools can sure do a lot of damage. Like JYW, the build is aimed at making a machine to meet a certain challenge. The second "Destroy" in the tittle comes what happens to the losing teams machine. It is pretty, well, final. I introduced it to the little guy tonight, and we're currently in the "just one more." phase of the evening. I'd call that a hit.